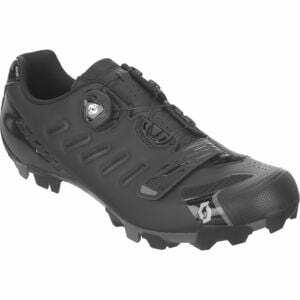 Send it up switchbacks and blast through rolling miles of singletrack with the quick-reacting power of Scott's Men's MTB Team BOA Shoe. Built for adventure, the MTB Team BOA's are versatile and ready to tackle miles at your local trail network for midweek XC race night, or push further up the mountain to discover new and challenging trails laced with root lattices and rock gardens. They feature a stiff sole for putting your power to good use, and flexible uppers that give your feet a comfortable hug while you pump rollers, and push up climbs. Along the shoe's upper, a mix of pliable microfiber and airy mesh paneling wrap around the rolling bumps and bunions that make up your feet, mimicking leather's ability to adapt to different foot shapes, but not its lack of breathability or sensitivity to wet weather. Nylon mesh panels keep air moving on warm summer nights so your socks don't have to work overtime preventing the inside of your shoe from feeling like a swamp, while a mixed BOA and hook-and-loop closure system offers almost limitless potential for fit adjustments on the go. When you're throwing watts into the pedals, the MTB Team's fiberglass-reinforced nylon sole will back you up, without feeling painfully rigid on more relaxed trail rides.